Captain Lil Daughter pirate costume. 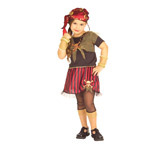 Includes: Shirt with attached vest, skirt, headpiece, arm bands and leggings. Size: TODDLER (size: 2-4,for 1-2 years old), SMALL (size: 4-6,for 3-4 years old) MEDIUM (size: 8-10,for 5-7 years old).